The Town Council’s new strategic grants fund has been established to provide small cash grants to local community groups, sports clubs and organisations to help them cover their running costs or deliver specific projects. The first application window will open on the 1st April and is open to all relevant groups in the Stanley parish area. For full details and to get an application form, check our Grants page. 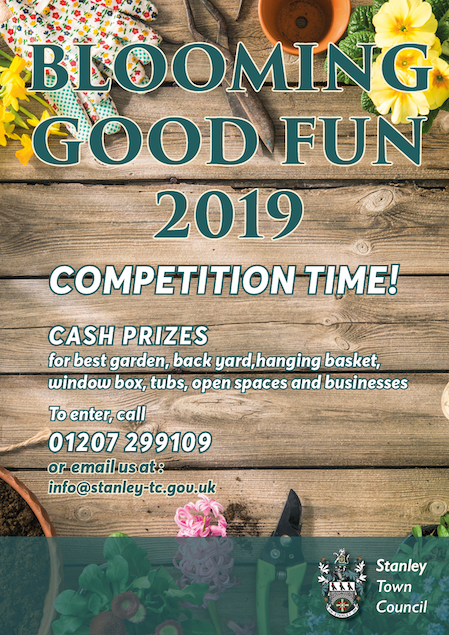 The Town Council are announcing the return of the ‘Blooming Good Fun’ competition for 2019, this time to support our application for an award in the Northumbria in Bloom competition. We are hoping to encourage gardeners from right across our Parish to make a special effort to brighten up their surroundings – and everybody else’s by bringing colour and floral displays to Stanley. Entry is FREE and there are CASH PRIZES to be one. There are awards for the best garden, tubs, window boxes, back yard, open space or communal space and businees so it’s open to everybody. The Annual Meeting of electors will take place next Friday, 22nd March 2019 at the Venue, Tyne Road, Stanley. There will be tea and coffee served from 6pm for a 6.30 pm start. 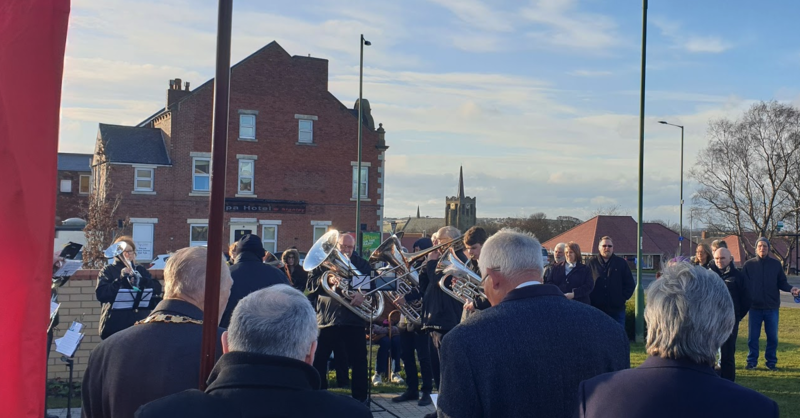 The Council will be launching the new Stanley Community Fund at the meeting, which is a new source of grant funding to support local groups and organisations which will provide £100,000 of support for local community organisations in the year from April. The fund is a true partnership and will see every pound invested by the Town Council matched from contributions from other funders, including Kevan Jones MP who will be speaking at the launch. All local community groups who rely on grant funding or would like financial support should come to the meeting to get full details of how and where to apply for funding. The Council will also give an overview of the work it has done in the last year and our plans for next year. 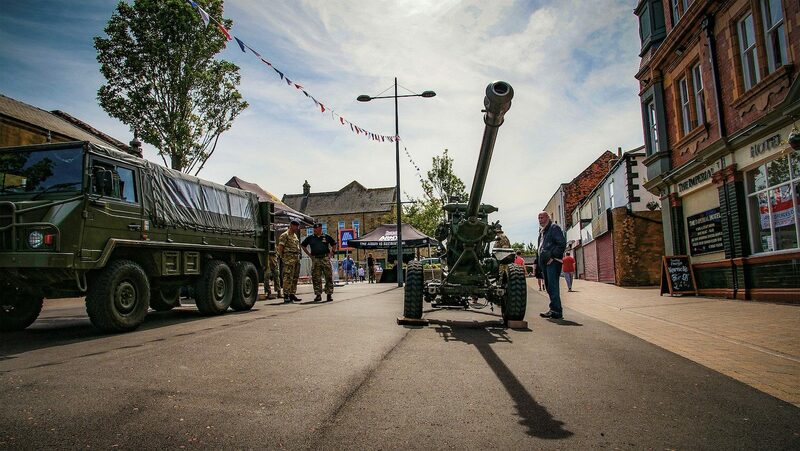 Next week’s Full Council meeting will see the Council considering proposals for a new Community Funding strategy for the Town, discussing a new ‘Miner’s Sunday’ Event to be held on the August Bank Holiday weekend together with other mining heritage initiatives. The meeting starts at 6.30pm on Tuesday 26th February 2019. All Town Council meetings are open to the public and the public are encouraged to attend. The Agenda and supporting papers for next week’s meeting of the Finance Committee are linked below. Items to be discussed include: Grant Funding and the Council’s Events programme for 2019. The meeting will be held at 6.30 pm at the Civic Hall. All meetings of Stanley Town Council are open to the public. A SERIES of investments, events and initiatives have been greenlit by Stanley Town Council after it agreed its annual budget tonight (22 January). 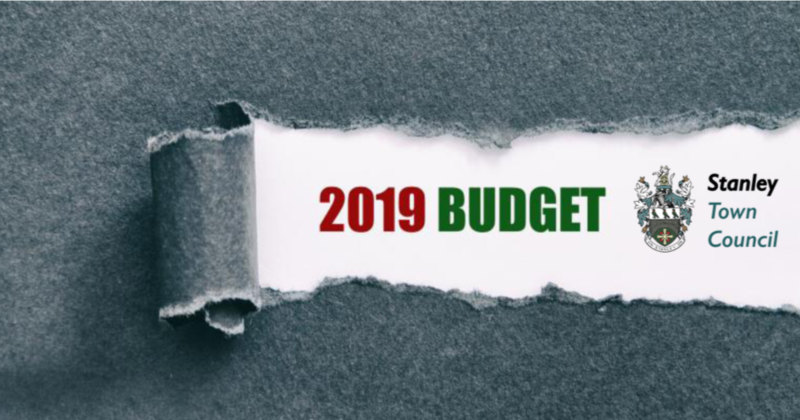 The Council backed the 2019/20 Budget and has brought forward an ambitious programme to help breathe new life into the town and surrounding villages. Amongst projects approved are the popular summer “Play in the Park” events for children and parents during the summer holidays, the purchase and upkeep of two new police vehicles to support local policing teams and the town’s Christmas lights, not to mention Stanley’s spectacular annual fireworks extravaganza. The Council is also developing a new approach to grant funding by creating a Stanley Fund, which will help to deliver more than double the current level of grant support to Stanley groups and organisations at no additional cost to residents by bringing in match funding from local businesses, local MP Kevan Jones and the Police and Crime Commisioner Ron Hogg. 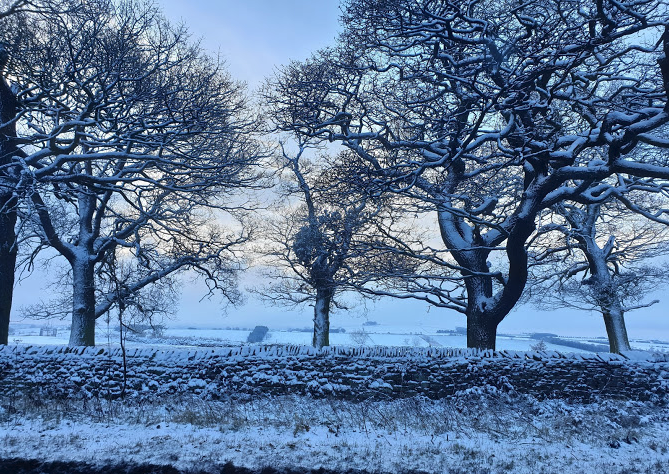 Leader of Stanley Town Council, Cllr David Marshall, said that the new budget would help the town and outlying villages add to the progress made since the make-up of the authority changed in the 2017 local elections. “Last year was the new council’s first opportunity to look at investment priorities for Stanley and ensure that every penny spent is aimed at making things better for the people of our area,” said Cllr Marshall. “For too long the Council had not been addressing long-term needs, so we asked the people who voted for us to tell us what their priorities are and how their money should be spent. From that feedback, we created the Medium-Term Plan to help us focus our budget in areas of maximum need where our spending will have the most beneficial impact. The Council has been forced to increase its precept by 3% from the level set in the 2018/19 Budget. Last year, the Council’s funding enabled Stanley residents to benefit from a five day a week face to face debt management and advice service provided by the Advice in County Durham partnership in what is seen as a model service in the County. The Council secured a new building for the Just for Women Centre, a multi award winning project supporting vulnerable women in the heart of our community. The Council launched a new dedicated community wardens service to support commnuities and improve the environment, provided a detached youth service to engage with young people and continued to support PACT House, which has become a vital community resource since it began operating 3 years ago. “As a Council, we have agreed that these services which are vital to our residents need to continue to be funded. But there is more work to be done”. Now agreed, the Budget will allow the Council to roll-out of its new festive lighting programme to villages and outlying communities within the parish, as well as improve its heritage and events offer with the creation of a ‘Miner’s Sunday’ celebration and greater support for memorial events within the Town Council area and the new Beacon of Light in future years. The Council is also planning to bring community cinema back to the Town by re-commissioning the cinema capability of the Civic Hall. Chair of the Finance Committee, Cllr Mark Davinson, said: “This Budget allows us to press ahead with our ambitions of making Stanley a better place to live, work and visit. 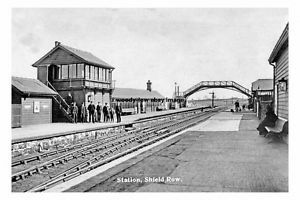 There is fresh impetus running through this Town with the recent investment in our retail offer and the raft of environmental improvements the Town Council has been able to introduce, and long may that continue. 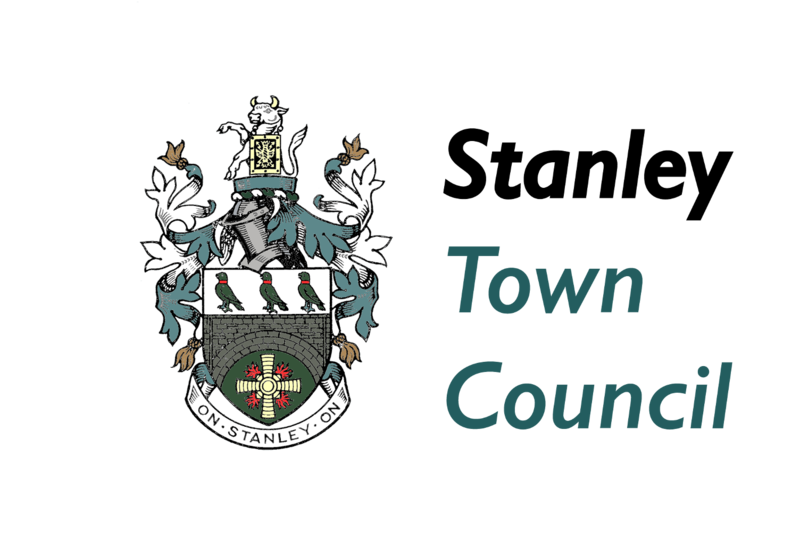 The January meeting of Stanley Town Council is the meeting where the budget will be set for 2018/19, which is the main item of business. Other business to be discussed includes Stanley in Bloom and the Policy working group. All STC meetings are open to the public. 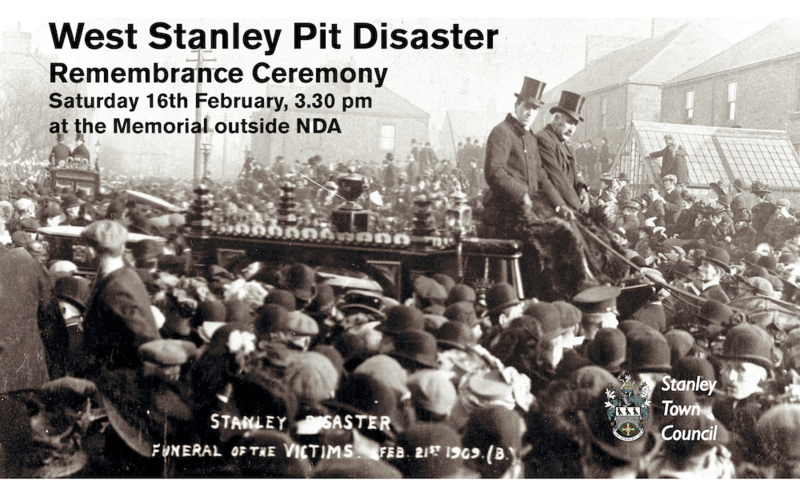 The meeting will be held at 6.30pm on Tuesday 22nd January 2019 at Stanley Civic Hall.